Javin played a heck of a game. Here is what he had to say. DURHAM, N.C. -- Duke basketball head coach Mike Krzyzewski announced Friday that junior forwards Javin DeLaurier and Jack White will be the team’s captains for the 2018-19 season. The pair are two of Duke’s top returning players from the squad that went 29-8 last season and reached the Elite Eight of the NCAA Tournament. Being selected a Duke captain by Coach K is one of the most important responsibilities bestowed upon a Blue Devil. 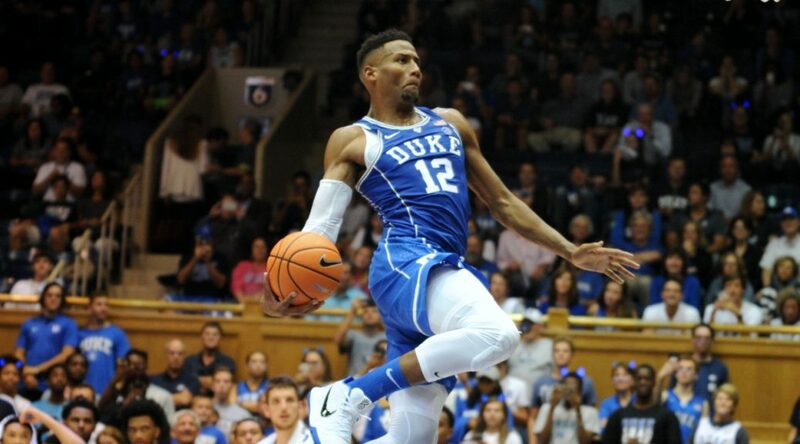 Each member of Duke’s current staff – Nate James, Jon Scheyer, Chris Carrawell and Nolan Smith – served as a captain while playing for Coach K.
“It’s a tremendous honor and I’m very excited for the chance to lead this team,” said DeLaurier, a Shipman, Va., native. “We have a great group that’s capable of achieving all of our goals as long as we stick to the plan. I'm so grateful and humbled to be chosen a captain by Coach K."
No. 4-ranked Duke opens the regular season November 6 versus Kentucky in the State Farm Champions Classic. 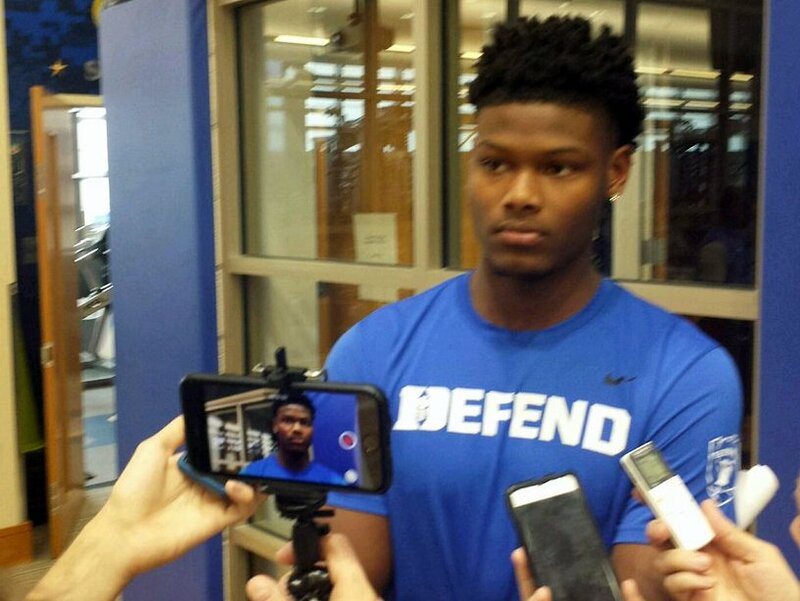 Duke Basketball tidbits - Reddish will not play in Canada. 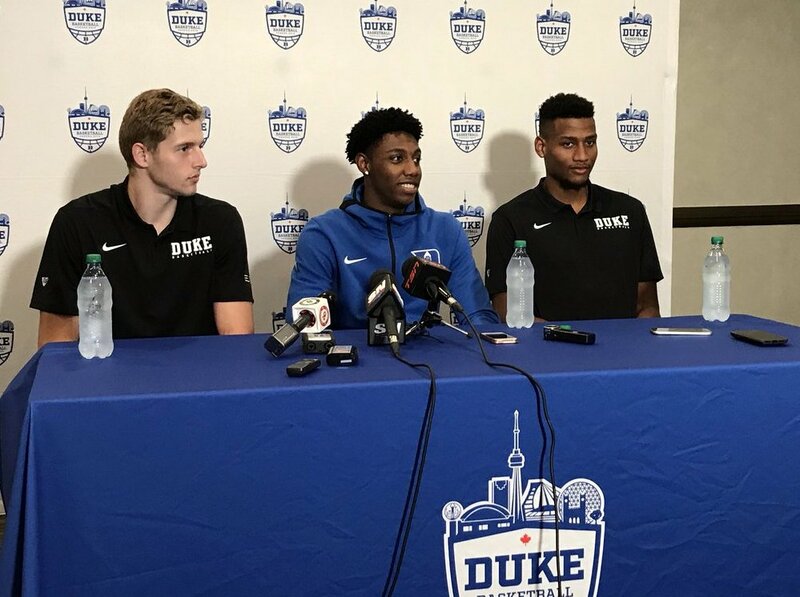 Here are some highlights from Duke coach Mike Krzyzewski and players Marques Bolden, Javin DeLaurier and R.J. Barret before the teams trip to Canada. Marques Bolden said that the freshman are fundamentally sound and know how to do the little things already. Bolden was asked about the transfer rumors a season ago and said it was never a true option for him. Bolden said that much of his offseason work concentrated on his motor and eating habits. Javin DeLaurier worked out with teammate Justin Robinson and his Dad David in the offseason where he took kickboxing lessons and also yoga while in San Antonio. DeLaurier said his role was to lead as an upperclassman and that he joked with Bolden that they were the older guys now. He joked that the freshman came up and asked if there were practices on Saturdays in which they laughed. The freshman are especially close and work hard and are ready to listen according to DeLaurier. 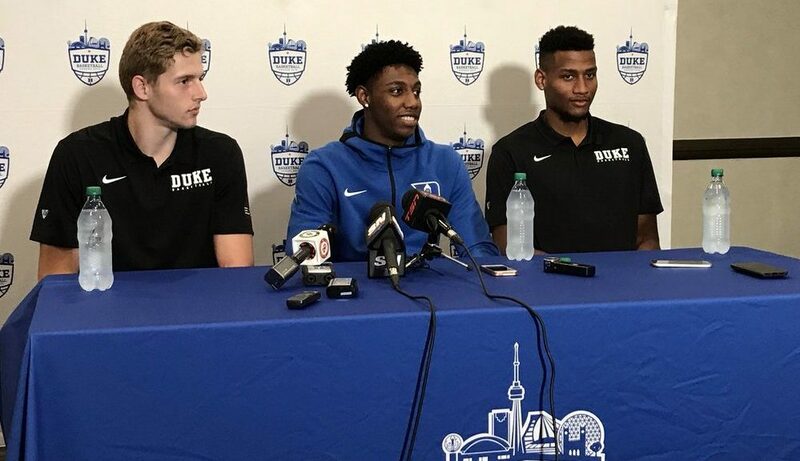 R.J. Barrett said he was excited to return home with Duke and see his friends. Barrett said he had worked on his outside game and hoped people backed off him in games. Barrett said that a big part of his game was to make plays and that he could run the point if needed. Barrett said he has achieved good things while in Canada and grew up watching Andrew Wiggins and that the younger generation now looks up to him. Barrett said Javin was one of the hardest workers he has seen. Barrett said that Krzyzewski just allows him to play and he was one of the funniest guys he knows. Krzyzewski said he just wanted his players to play to their strengths without position worries. Krzyzewski glowed when he talked about Zion Williamson calling him a great player and young man on and off the court. He said his weight was proportioned to his body type and that he had good lateral quickness. The first Mike Krzyzewski coached Duke team to take an offseason foreign trip was the 1983 group to France. Freshman at that time could not make the journey per NCAA rules, but that has now changed. Thank goodness for said changes, in that Duke will rely heavily on freshman this season and two of them in Tre Jones and Cam Reddish will be sidelined for their upcoming Canadian trip. 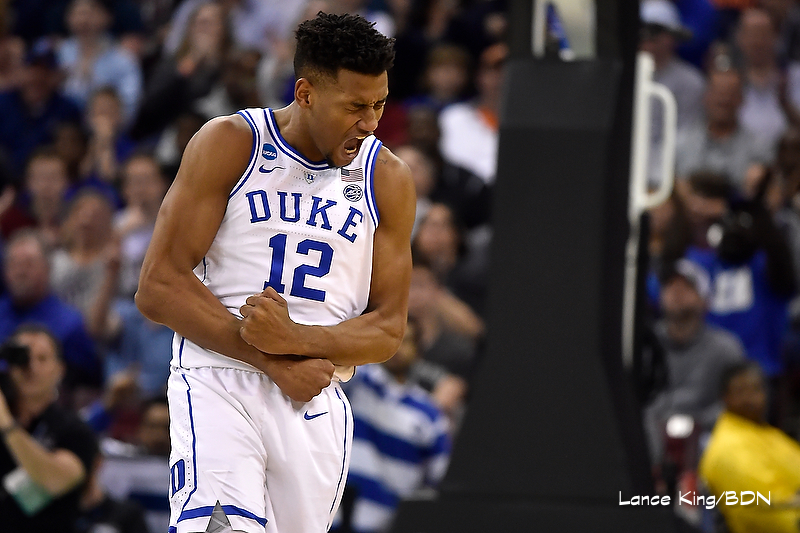 It was announced earlier today, that Cam Reddish is hobbled by a groin injury and that Tre Jones had yet to recover fully from an issue with his hip. While both players will be ready to go for the season and are participating in some drills, Krzyzewski will err on the side of caution and sit his prized freshman but did call the injuries minor. Duke has completed seven of ten allowed practices to date. "So far, I couldn't be more pleased with the chemistry that has developed and these guys have been really fun to coach," said Krzyzewski. Krzyzewski also said they have not been pushing conditioning as of yet, stating that his team was in decent shape but the staff did not want to push them too early. "For this trip, it is impossible to put in your entire system, so we are trying to keep it simple and see how our guys play." 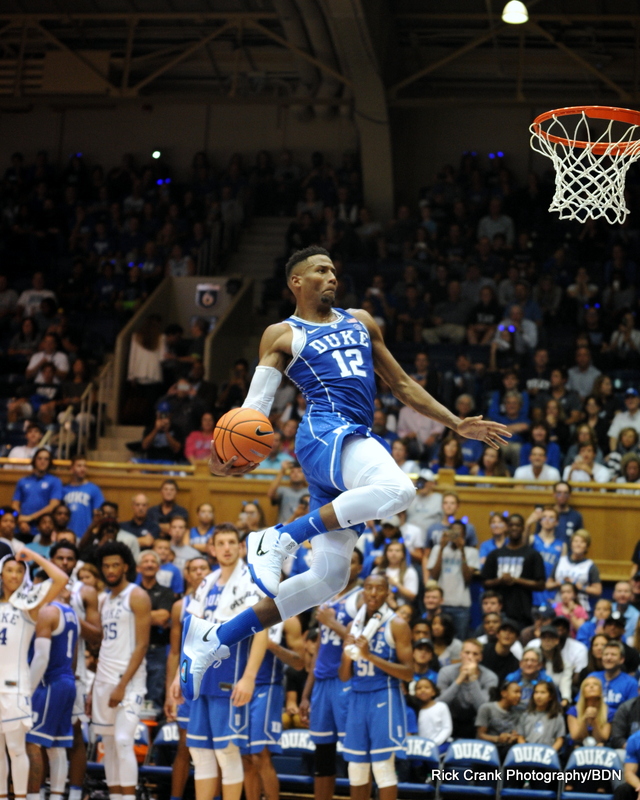 As for the veterans, Krzyzewski said that Javin DeLaurier has played great and not just good. And that Marques Bolden was healthy and adjusting to a new position and how he will be used. Other notes from his press conference were that Jack White has lost ten pounds and is shooting the ball better per Krzyzewski and Alex O'Connell has been playing well. 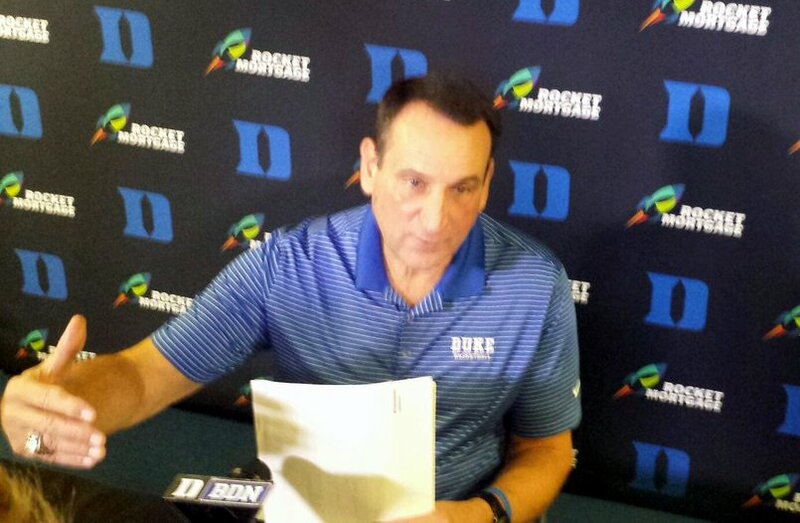 The Duke coach also said the team would run a different offense this season with five men out and more motion. And there was a strong hint that the team would get back to playing some man to man defense. Before Kryzewsski came out for the media, R.J. Barrett took to the podium. He was asked if there were instances where he could run the point as a lead ball handler in which he said yes. Krzyzewski would later say that as well, "Having those two guys (Jones, Reddish) out will hurt our ball handling for the trip and there will be more emphasis with R.J. being out there. 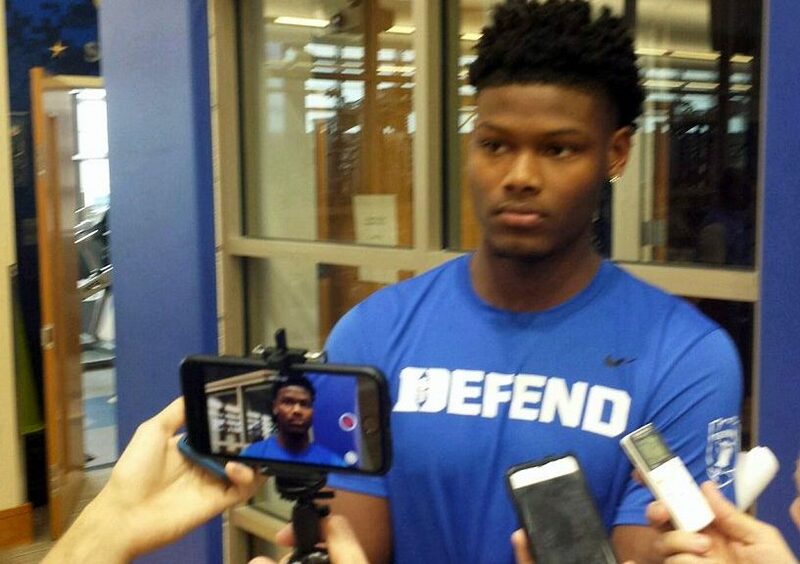 Alex O'Connell will help and Zion (Williamson) will be all over the place "
Krzyzewski also said this years group would be good defensively and that they would do a lot of things differently than a season ago on offense where he expects the players to have the freedom to create. Duke will leave for the Toronto area on Sunday where they will play three games in six days. One of the players likely to play a major role on the coming seasons Duke Basketball team will be rising junior Javin DeLaurier. 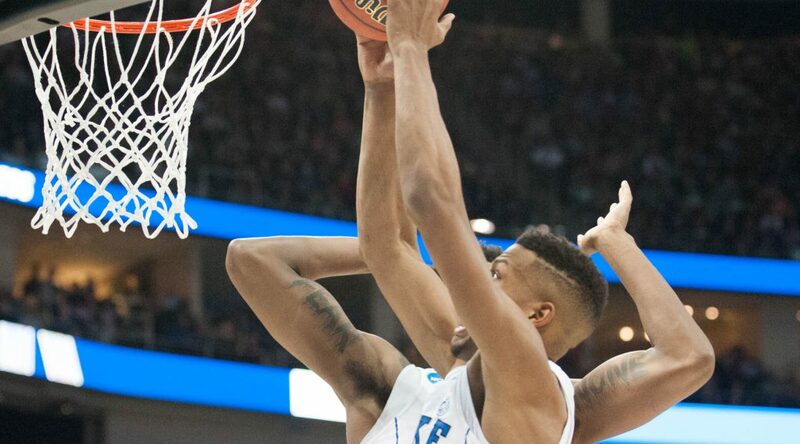 In his third year at Duke, DeLaurier hopes off-season work will take his game to another level. We spoke to the rising junior during the recent Coach K Academy in Durham, N.C. which helps to fund the Emily K Center. 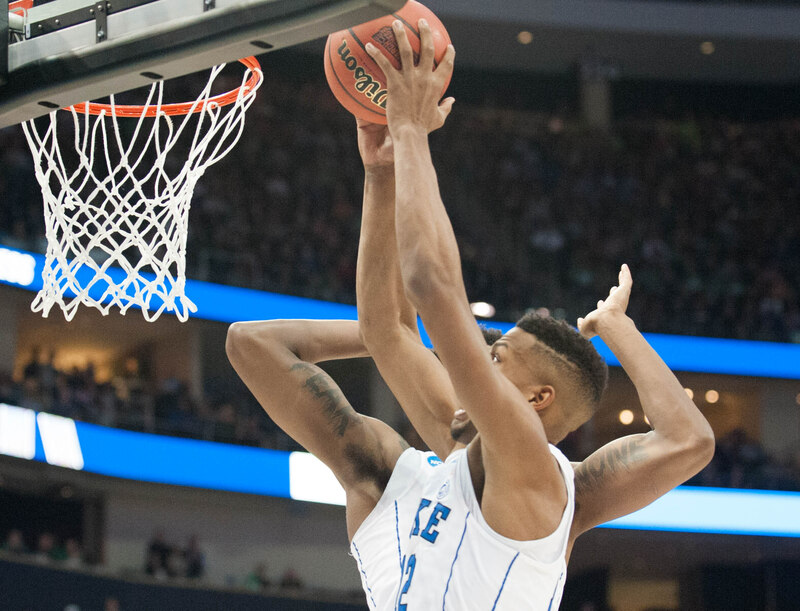 DeLaurier shares how he will embrace his role as an upperclassman to teach the Duke way to the incoming freshman class while at the same time working to improve his game. You're like the old guy on this team now. How does that feel? Yeah. It's weird to think about. My third year came around pretty quick -- quicker than I expected but at the same time I'm excited to get these young guys here and to teach them how we do things here at Duke. What has the staff shared with you about teaching the newcomers? The entire coaching staff, including Coach Will (Stephens, Duke Strength Coach) has stressed the importance to all of us upperclassman to really be leaders and set an example for these young guys coming in. They're super talented but as freshman it takes some adjustment. During his press conference, Coach K said he wants to see what you guys look like together; not just the freshman but the upperclassman as well who will all play larger roles. Can you share a little bit about what they've shared with you about this thus far. You know it is just going to be different this year than last year. We obviously lost two talented bigs in Marvin (Bagley) and Wendell (Carter) and I might find myself more in the post. That is something I have to prepare for. When you look at the roster it would appear that you are one of two post guys projected to play significant minutes..
Yeah. No doubt, no doubt. Yes sir. I know there will be some guys bigger and heavier than me in the post. I am looking to learn how to guard guys, especially guys who are bigger and heavier than me and developing more confidence to score down there. What will you be working on the rest of the off-season? I am looking to build my confidence up, my skill level and be more of a scoring threat.